No matter the sales market there is a common denominator, market qualified leads. Conquer Local travels to South Africa this week! We pick the brain of Lyndon Munetsi, Chief Revenue Officer for Trudon, the publishers of the Yellow Pages in South Africa. Lyndon takes us through the journey and the pain points he experienced coming into an organization that has been operating the same way for the last 30 years, the struggles from organization structure, and developing new ways of operating in digital. There is a unique nature to the South African market, there is the ultimate rich to dirt poor people, blue chip companies to small businesses, and capacity to have 500 qualified leads per day to 5 leads to day. Prior to joining Trudon, Lyndon worked for Accenture as a Digital Transformation Lead, driving transformation activities with listed companies in the Resources, Retail and Telco sectors. He has also held Executive level roles with some of the leading Telco and Media entities in Africa. He has led multifaceted digital teams in driving company-wide digital transformation programs, product innovation, development & execution, digital sales and marketing. George: It’s the Conquer Local podcast. My name is George Leith. This is the winter 2019 cold edition. No, it’s not some new thing, and it’s not an impersonation I’m trying to do or something like that. Coming up in just a moment, we are going to dig in to what it’s like to run the largest local sales organization in South Africa with Lyndon Munetsi, the CRO of Trudon Incorporated, and I’ve had the privilege of working with Lyndon over the past year or so. We’re going to learn about what Trudon is doing for sales prospecting, how their sales teams and organizations are structured, and what sales tools they’re using and software is doing to transition their organization into a digitally-enabled sales force. All that is coming up with Lyndon Munetsi, the Chief Revenue Officer of Trudon on the Conquer Local podcast next. Well, I’m super excited about this edition of the Conquer Local podcast. 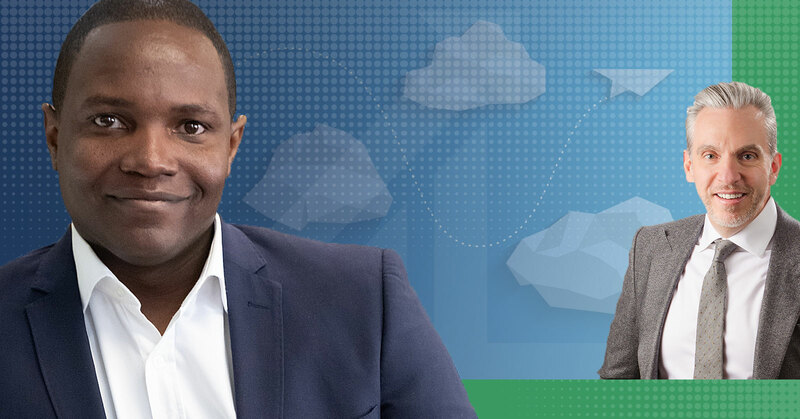 Lyndon Munetsi is joining me, the Chief Revenue Officer of Trudon in South Africa. And I’m very excited to have Lyndon on the show. We have been working together over the past…well, if we go back to when we first met, it was about a year and a half ago. But we were working very closely over the last six months and Lyndon, thanks for making some time to join us and to go through some of the questions that I have around your very unique markets that you serve in South Africa. So welcome to the podcast. Lyndon: Thank you very much, George. It’s a pleasure to be here. George: Before we get into the South African market and what you’re experiencing with your sales team, which is well over 100 people spread across a number of different markets and all of them out there trying to conquer local on a day-to-day basis, can we talk a little bit about your experience because I think it’s interesting to see how you arrived as CRO at Trudon? You spent some time with Accenture, when I look at your LinkedIn profile. Lyndon: That is correct. I was a digital transformation lead at Accenture responsible for basically driving digital transformation programs with some of our blue-chip partners at that time. And you’re pretty much talking about some of the biggest listed companies in this part of the world. And as you will know, obviously, digital transformation is something that’s happening just about everywhere at this stage. My particular interest was somewhat unique in that I oversaw digital transformation in a few very interesting segments. I took care of some of the retail customers, I took care of some media partners. And I also did a bit of work with some of the resources partners, which is your mining companies and that sort of thing, which is a whole different world from what I’m typically used to. Accenture was definitely a very, very interesting experience. George: You know, that’s why I asked the question because I think it’s really interesting that in your previous life, which was, you know, 10 years ago at Accenture was on the leading edge of digital transformation because, you know, we’ve been seeing digital transformation for quite some time. So when you arrive at Trudon and promoted to the Chief Revenue Officer here in the last four or five months, what do you see as some of the biggest challenges for your business model in making this transition to digital, if we were to break it down into, you know, two or three? Lyndon: I think the fact that we’re a legacy business, which means everything about the way we operate here was built around a set of parameters that created to service the delivery of a print publication. I believe conversations around digital began here in the early 2000s, but they were just that. They were conversations. There has been this critical need for us to grow into a fully-fledged digital business. And a key part of that required that we make a very hard decision, which we made I think late last year. And that is that we are not going to wait for the decline of our print revenue to a point where it is unsustainable. Rather, we are actually going to manage that process ourselves. And we’ve given ourselves a timeline by which time our digital revenue will have exceeded and catered for any revenue we’re making off of print, and at that stage, we’re hoping that we will then have the luxury of choosing when we flip the switch. And with that has come the need to innovate our sales team. We recently deployed the Vendasta platform into our day-to-day sales experience, and we’re deploying it into our fulfillment side as well. All of this with a view to transforming the way that as a business, we are actually approaching the market. George: So I think that it’s real interesting insights that you’re offering there because you are coming from a traditional business model that has served the company quite well for quite a long time where you were putting businesses’ phone numbers in a phone book, you were distributing that phone book, and you still have rural markets that are very reliant upon that phone book. I think it’s important to note that. But the urban markets in South Africa are catapulting ahead when it comes to digital marketing knowledge and digital marketing acceptance. So you really have a two-prong approach where you still need to service a legacy customer that has an expectation, but then you need to be making this digital acceleration. But that the interesting insight that I see, and what you just said, was that what’s holding you back was all of the things that made you great in the traditional business model. And sometimes, we found in these organizations that are making this switch, that the cultural switch that needs to be made is way harder than the technical shift that needs to be made because when you make the decision to make the technical switch, you just have to find the right partners, put them in place and the technology is there, but getting the people to adopt those new go-to-market strategies is really the challenge and how is Trudon coping with this switch? And then how are your folks coping with that? And I mean the people that we are concerned about on this podcast, which are the people that are conquering local and helping their customers conquer local. I’m wondering how this whole digital transformation is…you know, the coping has been done by your folks in your opinion. Lyndon: Inevitably, I think there’s been a bit of pain. I mean, this is one of those unique organizations. And I’m in one of those very unique situations where I have people who report to me who started working for this organization before I was born. Whenever you step up to these people, and you tell them that this is how we’re going to do things now, their default response is, “For the last 30-odd years, we’ve been doing it this way, and it has worked. Why are you breaking it now?” Getting that mindset shift to actually kick in and take root has been our biggest challenge. And I think there’s been quite a bit of pain getting a lot of people to realize that, “Yes, you are fantastic at doing what you used to do, we just don’t do that anymore.” But at the heart of it has been the fact that we’ve had to get people to buy in to what we’re trying to achieve. And we’ve had to get a lot of our people to realize that these changes are not coming here just to disrupt their lives, but to actually ensure that we still have a business here in years to come. George: Let’s look at the customers. Let’s look at those end SMEs that Trudon is serving and that your salespeople are going out and calling on. I find the South African market to be absolutely exhilarating because in Johannesburg and Cape Town, you have these very modern ecosystems that have been built, beautiful buildings, large organizations, you have a massive FinTech industry there. You know, we go a mile and a half to the east, there is a township with four by four shacks and its own ecosystem of businesses inside those where there isn’t even a street sign. So you have this amazing kaleidoscope of businesses, everything from massive organizations right down to the small SME, and Trudon serves them all. So how is that going to be possible in a day and age where we’re trying to serve the needs of the customer rather than just selling a product to them? You know, how are you embracing that challenge? Lyndon: And I’m glad you’ve asked that question because that is one of the things that defines just the unique nature of the South African market. We’ve got ultra-rich and absolutely dirt-poor people living quite close to each other. While you’ve got the blue-chip companies and with their sophisticated requirements, at the same time, you’ve got your absolute small business, or sole proprietor who’s basically working as a carpenter, making sure everybody’s shacks in the township are holding together. We have had to find ways to position our products in ways that speak to both sides. You will find that with our key accounts approach, we’ve got a far more sophisticated data-led approach that speaks to the virtues of working off of our platform and, you know, how we connect, you know, consumers and customers with businesses and vice versa and so forth. But to the guy who is basically eking out a living in the township, he is looking for basic business needs. In fact, he can’t actually deal with 20 leads a day, he’s only got scope to service 5. So we just exist to make sure that he gets those five leads a day. As long as he gets those five phone calls from people that are saying, “Hey, I’m looking for a plumber or a carpenter.” Across the freeway in Sandton, which requires that we deliver 500 qualified leads a day, we’re able to do the same. George: The way that you’ve done this then is you have a key account managers that have a higher skill set and a larger stock. You have premise reps that are more transactional and it’s probably a longer contracted sale for them to have to go back to those customers because their needs are smaller. Lyndon: Yes. And in fact, it’s a bit of a pyramid where we’ve got at the very base of the pyramid, for your typical sole trader, we sell to those people typically using our call center sales service, which is able to just basically sell at scale, basic simplified solutions, nothing too complicated that your typical sole trader will not understand. And it’s a scale part of our business. We try and have as many of these guys as possible signed up and we deliver them the service using our online platform. And then, of course, what we call our Premise channel, which is our account manager layer, speaks to your more medium-sized businesses, businesses that have possibly 3 employees right up to potentially 20 or 25. Sometimes, it’s a bit more of a structured sale, understanding the customer’s objectives, and making sure that what we’re offering actually speaks to those objectives. But it is still not as sophisticated as what we’re doing on our key accounts layer, which is the top of the pyramid, where at that stage, really, a typical sale could take months, but it is a very in-depth and sophisticated sale that speaks to the many complex requirements of a business of that magnitude. So we’ve stratified our sales operation into those three fundamental areas. And we’ve recently got an approval to kick off an independent sales agency network as well where independent partners can sign up as resellers and actually conduct some of these sales on our behalf as well, subject obviously to some kind of internal certification program that we feel is critical for anybody who’s going to go out there in our name and speak to the market. So it’s a complex setup in many ways where the KPIs on each level will differ, but everything feeds back into the single revenue parts that we are all chasing at different points in time. George: Well, I think it’s really interesting how you have developed your go-to market strategy to solve for the challenges that you have. And some of those challenges, I would say, are not unique. Other organizations have faced them. It’s just that you are facing them today. And, you know, I will tell you, I know that this is a challenge for you, but I will tell you, you are fortunate because you have models of other organizations that have went through this challenge in various other markets in the world. I do want to touch just one moment because I’m sure our listeners are wondering, you know, “What are the customers like in South Africa?” Great fortune of going on some four-legged calls with some of your reps. We actually traveled outside of Johannesburg to a smaller community about an hour outside. I won’t even try and pronounce the name because I know I’ll butcher it. But the interesting thing was we went and called on an optometrist and, of course, I’m along, so “We’ll bring the Canadian in and we’ll have him ask some questions.” And I really found it interesting that all of her challenges were exactly the same as I have heard on hundreds and hundreds of other four-legged calls in North America, in Europe, in Australia. There is not a set of challenges that are unique to a market in what I’ve been able to find. If there is, if there’s a market out there that have a set of challenges we haven’t seen yet, I’d be very surprised. And I think that that’s the important piece for people to understand. When we’re going into new markets and we’re talking to these customers, you know, they want to be found, they want to have customers trust them. So they need to have a good reputation. They need to have some sort of presence on social media because that’s where the eyeballs are, but I’ll come back to what you said earlier, and I just want to hit home on this. At the end of the day, they want one thing and that’s they want those leads. They don’t really care, technically, how you get there, they just want that one deliverable and your report on the deliverable. Now, when it comes to the tech-savviness of your SMEs that you’re calling on, where do you think they fall? And let’s go through the three cohorts just quickly. So we’ve got the small person, tech-savviness in the township, you know, scale of 1 to 10, probably a 1, right? Lyndon: We’re starting to find that with the manner in which some of the big players like Google and Facebook have kind of infiltrated the market with their own information sharing programs and that sort of thing, we’re finding that your typical small player is starting to understand a lot more about what is possible. They’re starting to ask a lot of questions, they’re starting to question a lot of the things we say, and our salespeople are having to actually justify some of the propositions that they’re putting on the table just to prove that this will actually work. With the smallest customers, we definitely are finding that they’ve definitely moved from, on a scale of 1 to 10, they’ve moved from being 1s and they’re probably ranging at about 5 at this stage. George: So Lyndon, I gotta tell you, I baited you into that question because I think it’s important for our listeners to understand that you were mentioning one of the poorest areas of Africa is five miles from or two miles from one of the richest areas of Africa. And I think that there’s this common perception that the smaller businesses don’t understand, don’t need, don’t get. But what we’re finding, and we find this across all of our markets that we deal with and I have yet to have somebody prove me wrong on this, is that they want to know. So they may not have the deep technical knowledge, but they’re starting to watch YouTube videos, they’re going to seminars, they’re attending…they want to learn because they have a need inside their business. So I think that it’s really important that we, you know, as salespeople, we understand that we need to do that constant learning. You know, as sales managers, you’ve had to run into this objection where you’ve got those senior reps that have been here for a long time, pretty good at what they’ve been doing, and they have that question of, “Why do I need to do this?” And you better have a compelling reason, keep reiterating that reason to those folks. And then also, I think what you said, and I don’t want to put words in your mouth. So I just want you to validate this statement. If you are going to go through a digital transformation, there probably will be some people that just won’t be with your organization because they’re not prepared to make that switch. George: And did that piece surprise you as to how large that cohort ended up being? Lyndon: So I think it was a bit of a shock. Well, you typically expect that people will be objective and progressive. A lot of these people became very, very comfortable in their roles and they did not see the needs to grow themselves, to try new things, to explore some kind of career growth or anything of that kind in looking and understanding why they became so resistant. The reality is this thing called digital can be quite intimidating, and it’s especially intimidating if the manner in which it is approached is one where people are being informed that they need to get with the program as opposed to an approach where people are being taken on a journey where they are being empowered and enabled and so forth. And unfortunately, I think in the case of Trudon, at some point, people were simply told to get with the program and a lot of them just ended up with a deer-in-headlights-type situation. But I will say that on the positive side, we’ve also had lots of these people who’ve actually embraced it and said, “Okay, well, how do we make this work?” I mean, I bumped into one of our salespeople earlier today and he was telling me that he last went out with a printed proposal to a client late last year, he just doesn’t do that anymore. That in Trudon terms is fantastic. George: Right. Very exciting. Well, Lyndon, I appreciate you taking some time for us. I hope you are enjoying the heart of your summer, enjoy the warmth. Thanks for your time, thanks for joining us on the Conquer Local podcast, and we’ll see you soon. Lyndon: Thank you very much. George: Virtually, every business is in the middle of some sort of a digital transformation, maybe not directly in the middle, but we’re somewhere between the beginning and the end. And I think it’s important that we understand that and we have some empathy towards that, not just in the day to day with the sales team, but the fact that our customers are in the middle of some sort of a digital transformation. It’s interesting. Lyndon has been involved in this space for quite some time going back to his days with Accenture. The segmented market approach was another key takeaway from this broadcast, and we keep hearing it over and over again. If you’ve got a customer, you know, only needs a few leads, then that’s going to be more transactional sale and you don’t need to go back and see him every week because there just isn’t the need there to continually optimize either their ad spend or what they’re doing in their marketing. They need a lesser…a depth of their marketing approach is less. Now, as we move to larger customers, you’re going to have to have that segmented approach with maybe a sales rep that understands the space better, maybe their vertical specific or something like that. So, segmented market approach that’s customer-centric is something that’s really helping Trudon in their transformation. And then another thing, and this was an underlying current, and maybe it wasn’t directly, or we weren’t directly able to hear it. But Lyndon is saying in that broadcast that alignment by the leadership is a really important piece to transition the organization. You need everybody pushing on an ongoing basis that this isn’t something we’re trying, it isn’t a test, it isn’t a pilot, we are transforming the organization, and set out some clear goals that you’re going to measure to see if you are winning or losing. So a pleasure having Lyndon on the Conquer Local podcast. I’m George Leith, I’ll see you when I see you.